I don't know if anyone has noticed, but I've been posting more infrequently and it's mostly because of some work things. I've been putting in more hours and so I'm having less time to take pictures and write up reviews. With less hours, I've also changed up my morning weekday makeup routines and choices to get ready quicker but still look presentable. I don't actually use all 12 products pictured, but I wanted to give alternatives to create an easy peasy morning look. When I'm rushing, I usually reach for multi-use and easy to apply products. 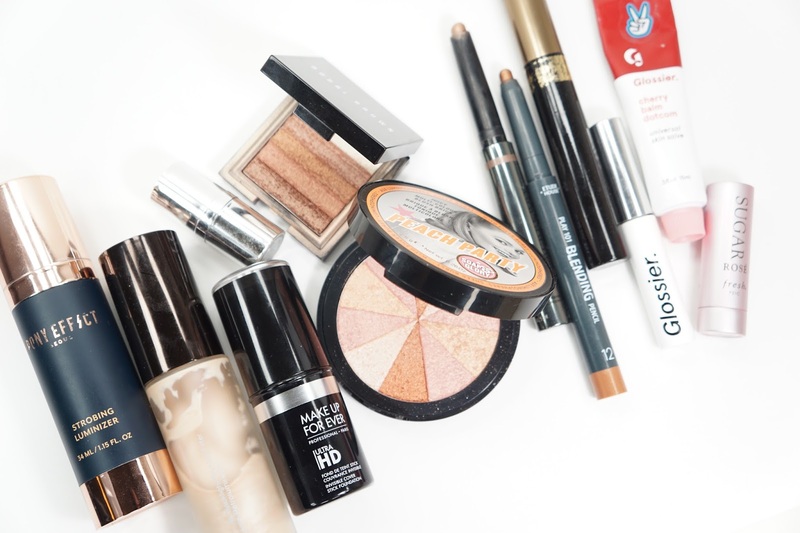 With my dry and often dull skin, I love using bases or primers with a bit of glow to them. My favorites are the Becca Backlight Priming Filter and the Pony Effect Strobing Luminzier* (review here). They both of some shimmer running through it to add a nice sheen to my face, but I can also build it up on my cheek bones or high points to add some subtle highlight as well. For foundation, I like using cream foundation sticks like the Makeup Forever Ultra HD Foundation Stick or Cover FX Cover Click Stick. They're creamy for easy blending, but not creamy enough to slide all over my face. I also love that I can also use these sticks in particular to build up coverage like a concealer on my acne marks and blemishes. Overly shimmery bronzers and colored cheek products aren't for everyone, but I like using the multi color / stripped versions since they combine color and highlight on my face but can also be used on the eyes like eyeshadows. My favorites are probably the Bobbi Brown Shimmer Brick in Bronze and Soap & Glory Multi Color Blush Brick in Peach Party (review here). The texture of both items are very similar and each pan gives enough space for individual colors to be picked up by eye brushes as well. These kind of products are especially handy when I only want to use one item all over the face because there are multiple colors and the pigmentation can be built up or sheered out depending on what kind of brush you use. Another quick eye product that are my go-to choices in the morning are cream stick eyeshadows! 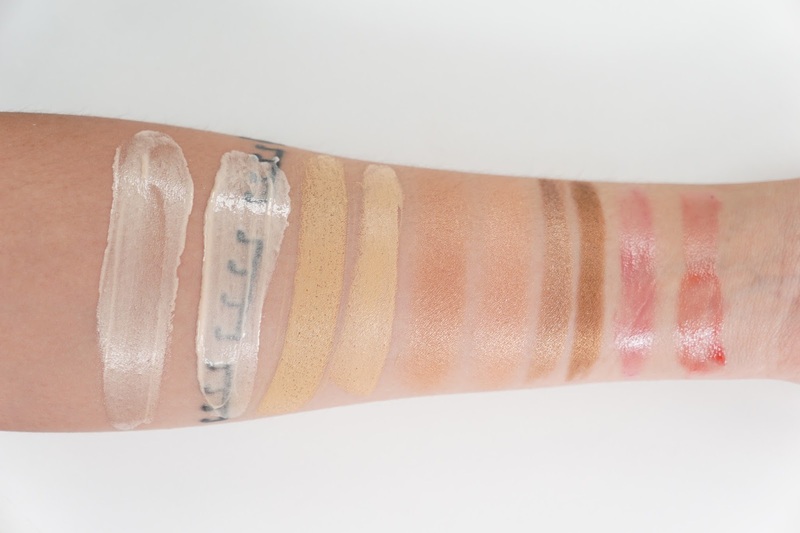 I like cream eyeshadows in general, but the stick versions are definitely my preferred choices. My personal favorites are the Burberry Eye Colour Contour Smoke & Sculpt Pen in 106 Pale Copper (review here) and the Etude House Play 101 Blending Pencil in #12 (review here). To me, they perform about the same and have the perfect amount of shimmer to add dimension to my eyes without going too overboard. I haven't tried other colors from Burberry, but the other two shades from Etude House have also become go to products depending on what color I'm going for that day. Generally, I do like to use brow pencils but brow gels like the Glossier Boy Brow or the L'oreal Brow Stylist Plumper Brow Gel Mascara are super handy when I want color and hold for my weirdly long brow hairs. I do like the Boy Brow more because there's a soft matte finish and isn't too wet, but the L'oreal one is pretty good at holding my brow hairs in place. If anything, I do sometimes go back with some extra strokes using a brow pencil to make my brows look neater when I haven't waxed them in awhile. Lipsticks are my absolute favorite, but getting those crisp lines in the morning when my eyes are barely open can sometimes take too much work. My lips have also been pretty dry lately and that's where tinted lip balms come in! I love reds and so the Glossier Balm Dot Com in Cherry or the Fresh Sugar Lip Treatment in Rose fit all of my dry lip needs. My lips also look a bit dead in the mornings and so the red really helps brighten and liven up my face as well. What are some of your go to morning products for an easy but put together look? Do you have favorite multi-use products? *This product was sent to me for free from Memebox for reviewing purposes. I was not paid and all opinions are 100% my own.